I operate only CW. No SSB or data mode QSOs. Ever. Sorry. Has my QSL been received and processed? Please, DO NOT send to the VP9, W4 or G bureaux. You will not receive a reply. 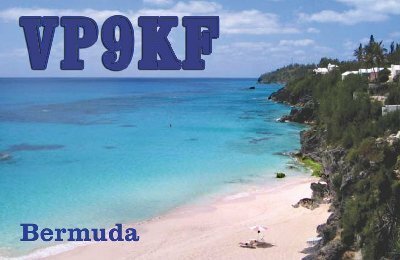 VP9GE is not my QSL manager, just my host. IRCs: Please, after October 2013 do NOT send IRCs. Please include US$2 to help defray expenses. If your card is two sided, make sure your call is clearly printed on BOTH sides. Flipping the card can sometimes cause mistakes. Do not place anything of a religious nature on your card (quotes, images, locations, clubs, etc.). They will not be answered. That means anything Christian, Muslim, Jewish, etc. That includes anything, including pictures, in the so-called "Holyland". Don't place anything of a political nature on your card (inc. such things as National Rifle Assoc., etc.). Don't place anything of an overtly nationalistic or overly patriotic nature on your card. If you don't do this, it is easy for QSL managers to make mistakes or for recipients to be offended. Always send a self addressed envelope it makes returning a QSL to you VERY easy and VERY much less prone to errors. Senders address on the top left of the envelope. If you put your own it will freak out the USPS (since 2001-09-11 they delay or destroy many sent this way). It makes life much easier if you include a self-adhesive envelope, rather than one with gum. It saves those tongue paper cuts which are truly awful. Buy a supply of them. Other DX stations will love you for it. The cost (at the lowest price possible) of a full colour QSL card is US$0.08. If you send US$2 and SAE it helps a lot!!!! Sending one from VP9 costs well in excess of US$2. A very complex calculator for USA mailing can be found here. Electronic "QSLs" - Why no eQSL, LoTW, QRZ.com or ClubLog? I signed on to eQSL, but there were too many people trying to falsely claim QSOs, so I dropped it. LoTW registration from outside the USA seemed impossible to achieve. I tried and gave up in frustration. Likewise, claims on QRZ.com (for their awards) and ClubLog are not accepted. Besides, these aren't really "QSLs", so I changed my philosophy and abandoned these electronic means. QSLs - Why are none sent out from me without getting one first? QSL cards are printed and being shipped direct.